I continued climbing with members of the Potomac Mountain Club who were in town for their annual trip to the Ouray Ice Park. All in all, there might have been about 10 people who came through from the club. It was good to see some old familiar faces, as well as meet a few that I hadn’t seen before. We continued climbing throughout different areas of the park, and exploring a few areas I had yet to spend much time in, like the Trestle area and the Grad School area. The Grad School is a fun area that, while limited in the number of routes, offers up some of the longer routes in the park–forcing you to lower in and belay from above, like the Upper Bridge area, though they much more moderate in nature, thankfully. I also connected with Mark E. who came out during the latter half of the Club’s trip. Mark is a mixed climbing enthusiast if I’ve ever met one. It seemed a little odd to me to fly all the way across the country to a world famous ice climbing destination for some Ouray mixed climbing, with more farmed ice routes than anywhere in the world, only to seek out pure rock routes to scratch your way up with tools and crampons. Which is something you could do almost anywhere without ice. But I also realized that there are some truly quality mixed routes available in the park and just outside the park as well, so I guess it isn’t that strange. Up until this point I hadn’t really done much mixed climbing, just a route or two here or there in the park, and a little in previous seasons. Mixed climbing is a fun and strange activitiy. More like rock climbing by its very nature with much more interesting movement and technique, as opposed to the relatively straight forward sequence of movement on purely vertical ice. It is also strange though in that you don’t have that tactile feedback of the rock that you would with rubber rock climbing shoes and your fingertips. You are more removed from the rock with the ice tools, crampons, and stiff boots–which makes it challenging to judge the quality and security of some of the holds. Mark was eager to explore some more of the mixed routes in the park and I was game to give them a shot–so he, Eric, and I left Grad School one afternoon and headed to the School Room where there were a couple mixed routes supposedly. Just as you come down the stairwell/ladder into the School Room there is a route right on the backside of the area–one I had actually never noticed before since I was always just focued on the ice in the opposite direction. The route (not sure of a name, but M5/M6) ascends a series of discontinuous, ledgy cracks before reaching the crux along the upper two thirds where it gets pretty thing before returning to a small but positive crack that is slightly overhung. Mark led the route cleanly and set up a top route for Eric and me to play around on. Eric did well for his first ever mixed climb, and he also had a clever comparison, saying he felt like a dentist, scratching around looking for little cavities where he could get some purchase with his ice tools. Hah! That’s a pretty sound analogy if I’ve ever heard one. Mark and I are basically the same boot size, so he let me try out his “fruit boots” (Kayland Dragons) which are a thin, light boot with bolted in mono-point crampons, which are ideal for mixed climbing–it gives you a little more ‘feeling’ and is more akin to a rock climbing shoe. I also used his Petzl tools, one Nomic and one Ergo, a unique idea to combine different tools, for sure. I didn’t find the route easy, by any means, and I didn’t go up cleanly–the crux definitely gave me some problems, but I managed to flail my way up the route, thankfully. I cleaned it and came back down since it was pretty much the end of the day. One day the snow was just absolutely dumping, which makes for pretty lousy ice climbing conditions (you’ve got to dig out the ice and it’s just continuously coming down on top of you as you climb or belay). 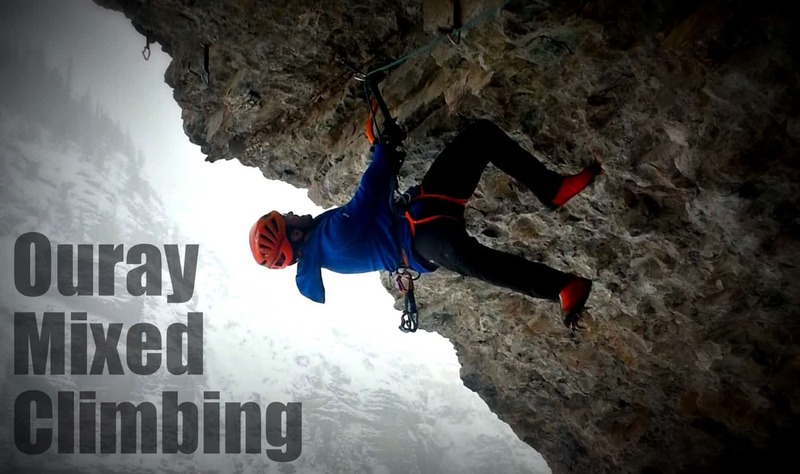 On top of that, they were also going to be flooding the gorge that morning–something they do on occasion apparently, which means you need to belay from above in most areas (in some places you can still do a traditional sling shot top rope belay). So instead of going to the park we decided to go check out the backcountry mixed climbing options up on Camp Bird Road. The drive up was fine, since they do a pretty good job plowing the road since there is a working mine up that way. You park beside the gate that blocks the road and then continue hiking up the road for 10-15 minutes to get to the bulk of the climbs. Some of the famous backcountry ice routes like the Ribbon and Birdbrain Boulevard are just across the way, unfortunately though, this year they never really came in. Right alongside of Camp Bird Road there are also a number of classic ice climbs, like Skylight. Just beyond Skylight there are a series of bolted mixed climbs which we hoped on. We started off easy, and Mark led the first route with ease, even with all the snow coming down and covering up the holds and ledges. We climbed a little more in that area before tiring of the snow. Mark had been eyeing a route in an area known as the Poser’s Lounge, a gnarly, super-overhung cave just off the road–the routes are obviously sporty, and are all bolted. These were way above my head, but I encouraged him to check it out since we were walking right by it. I could provide a solid belay at least! Mark hoped on Troglodyte, which goes at like M8 or M9. There was a stick clip stashed in the cave so you could clip the initial protection. While Mark wasn’t able to get the route cleanly, he did work his way through it, which was pretty amazing to watch. There are a few other lines in the cave that go even harder, the most prominent of which is probably Goldline–so named because it follows the obvious gold colored line of rock out of the cave. The Scottish Gullies area in the park probably has the highest concentration of quality mixed routes in the park–this is the area where the hold the competition during the ice festival. It is a great area because it offers such a variety of climbing, from easy ice routes, to WI5 routes, from easy and short M5 mixed climbing, up to the super challenging comp routes. It really does offer a little bit of everything–it’s also pretty much the most easily accessible climbing area in the park, just adjacent to the largest parking lot and the lower bridge, meaning you better get there early if it’s a busy weekend and you are looking to climb a specific route. Mark and I went there on a weekday to set up on Tic-Tac, the most popular and classic mixed route in the park. Even though it was a weekday, it wasn’t too quiet in the Gullies, since there was a large guided group from Chicks with Picks. Thankfully we managed to squeeze in and were able to set up on the route we wanted, since the Chicks with Picks were primarily focused on ice climbing, not mixed. Tic-Tac goes at M6 or M7 depending on the ice curtain at the top. The holds are all extremely positive–it has been extensively chipped out to almost resemble a peg board, not unlike an ice route that has been totally hacked out. Mark handled it with ease of course, but it really pumped me out as the first climb of the day, and I had to lower off. By this point in time, after more than three weeks of pretty regular ice climbing (rests days here and there of course), I was really beginning to feel a deep and compounding fatigue. My desk jockey body just wasn’t able to sustain this much climbing week after week, it seemed. I could get in a couple good climbs per day, but the pump and fatigue would kick in, and my technique would just go down the drain at that point. It was becoming quite discouraging. Dawn Glanc, with Chicks with Picks, was nice enough to let us hope on some of their ropes when they weren’t in use, so I was glad to hope on some of the adjacent ice routes. Much less pumpy than mixed climbing, I think. Fun climbing and socializing with everybody around–it was pretty much us, the Chicks, and a couple funny French guys. Mark was eyeing another route adjacent to Tic-Tac, Seamstress, which goes at M8. He top ropped the route first to preview it, while also preclipping the draws for his lead attempt. I climbed some more and then he psyched himself up for the sharp end. Pull the rope, tied in, and then off he goes. It climbs up a short ice step before arriving at the business end of the climb. He was climbing slowly, solidly, and efficiently throughout. Then about two thirds of the way up, he pulled up a length of slack for the clip… then POP. He comes off the wall mid-clip and flies through the air until the rope comes snug. It surprised me. Mixed climbing falls seem so much more unexpected. Thankfully the fall was clean and all was good. He lowered off though at that point and pulled the rope. After a bit of a break for him to collect himself and get psyched again, he tied in on the sharp end and set out once again. This time he got through the spot where he fell, cruised a few more feet and gently swung into the thin ice curtain above and then clearing the bulge with an enthusiastic yell. A pretty impressive climb, I thought, and well earned. He clipped the top rope anchor we had in place and I lowered him off. We decided to end the day on a high note. This would be last day ice climbing for a little bit, since I had to return to DC for a long weekend to take care of some lingering dental issues that happened just after I moved out of town. Fun! I told people that I strangely had to take a hiatus from my hiatus. All in all it was great climbing with the Potomac Mountain Club folks–it was especially cool to be have a small group where we could set up a series of ropes and then just rotate around throughout the day. It was also fun to get on some mixed routes with someone so psyched to share their love of mixed climbing. I picked up some great tips from Mark during that period, probably doubled the amount of mixed climbing I’ve ever done, and while I’m still not very good at it, I did manage to get a little better, I think. There are a pretty good smattering of mixed climbs throughout the park. The Scottish Gullies are certainly the epicenter of mixed, but there are other quality routes to be had in the Trestle, School Room, Five Fingers, etc. There are also a number of good routes up on Camp Bird Road where we where climbing, and there’s also the Hall of Justice area, which I never had a chance to check out–see this post from OR’s Verticulture for more info about it. Fun! I’ve done a bit of dry tooling on one route early in the season but that’t my small bit of experience on the subject. Looks like you had an amazing time though!! Hope your road trip is amazing, enjoy rock season!